I feel like I've been waiting forever for a new Jenny Han book. 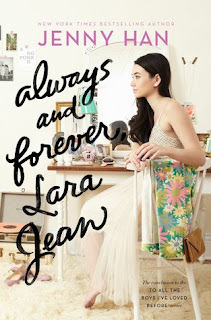 I love all her novels and was so happy to get the end of Lara Jean's saga. As always, Han's writing is beautifully descriptive and she has created a world that I want to stay in, eating Lara Jean's cookies and laughing at her irrepressible sister Kitty. Lara Jean is having an incredible senior year: she is dating her first love, is awaiting admission to her dream college, and is eagerly planning her father's wedding. But life never goes according to plan, even when you are super organized. The character of Lara Jean fascinates me, maybe because we are so different. She loves all the little details that make up a moment, the fashion extras like lace gloves and hair ribbons, the small variations from changing a recipe. I wanted to keep reading more and was sad when it was over. While Han said she won't write about Lara Jean again, I can hold out hope that she will write a book about Kitty someday!